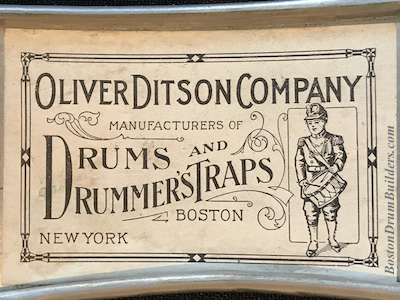 Boston's Oliver Ditson Company traces its roots back to the 1860s as a music publisher and musical instrument dealer. Before 1904, the John C. Haynes Company served as Ditson's manufacturing branch while the Ditson Company handled retail. All the while, Haynes and Ditson were essentially one in the same managed by singular ownership. In conjunction with Ditson's opening of their new quarters at 150 Tremont Street, John C. Haynes & Co. officially ceased to exist as of January 1st, 1904 though John C. Haynes remained as president of the Oliver Ditson Company as he had been since 1888. 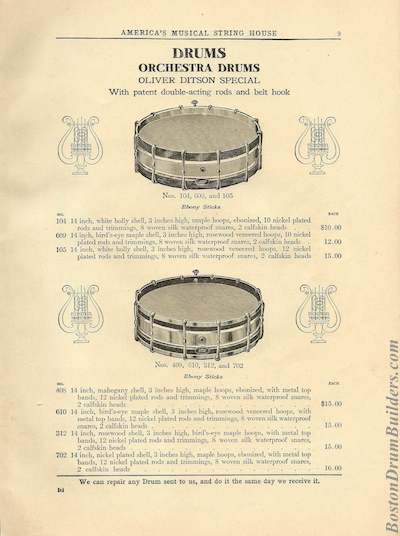 Drums labeled as being manufactured by the Oliver Ditson Company first appeared in 1904 and were produced through the 1910s. The nickel plated model featured here dates to the 1910s. Drums produced during the first decade of the 1900s, circa 1904 - 1910, list three Ditson branches including one in Philadelphia which was closed in 1910. The label affixed inside this particular example lists only Ditson's Boston and New York branches placing the date of manufacture at 1910 or later. Two outstanding pieces of provenance appear inside of the shell. A penciled-in date and name, presumably that of a previous owner, perhaps even the original owner, reads "Apr. 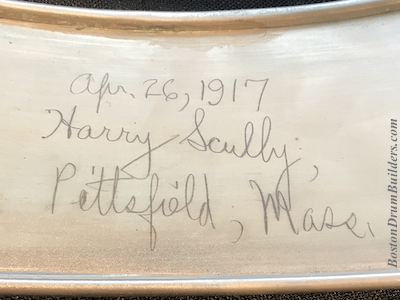 26, 1917, Harry Scully, Pittsfield, Mass." 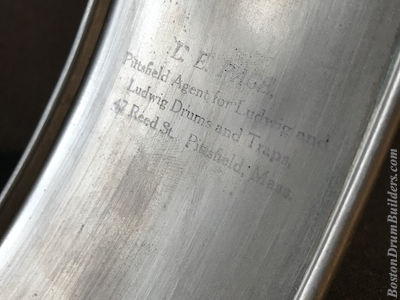 There is also an ink stamp from a dealer who may well have sold the drum: "L. E. Page, Pittsfield Agent for Ludwig Drums and Traps, 47 Reed St. Pittsfield, Mass." World War I draft records from 1917-1918 list Lewis Elliot Page, born August 31, 1887, as a machinist and musician in Pittsfield employed by the General Electric Company. Richard Harry Scully's draft card, complete with a signature matching the one found inside of his drum, lists his date of birth as November 28, 1890 and his profession simply as farmer. The shell is formed from a single sheet of metal riveted at the seam and rolled over at the bearing edges. 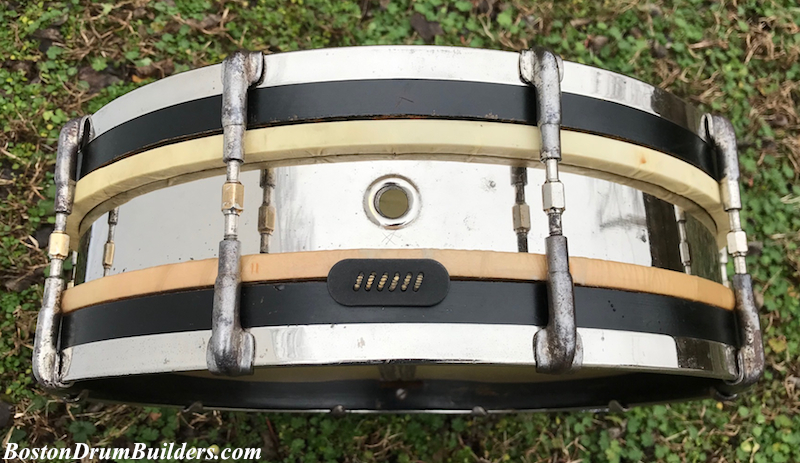 Snare beds are rather crudely hammered into the snare side bearing edge. The wooden counterhoops are described by Ditson advertising as "maple hoops, ebonized, with top metal bands". 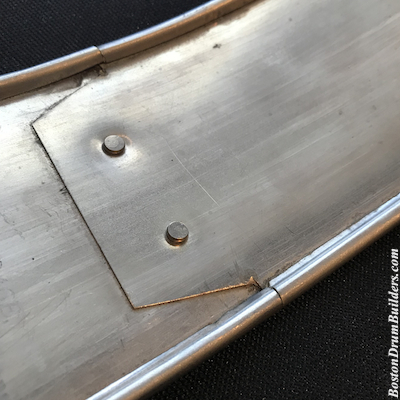 The metal bands are rolled over on the inner edge much like the shell's bearing edges and, beyond cosmetic flair, provided protection against damage from rimshots. 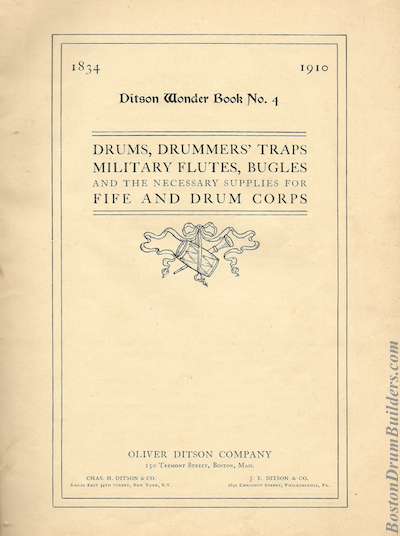 Ditson offered their Orchestra Drums in a variety of shell materials including bird's-eye maple, white holly, mahogany, and rosewood. These options and more are listed in Ditson's "Wonderbook Number Four" published in 1910. The catalogue spans more than seventy pages in length and lists instruments ranging from drums, cymbals, bells, and percussion accessories, to wind instruments including flutes, piccolos, trumpets, and bugles. As Ditson was a large music house with multiple branches, they were no stranger to the practice of selling instruments made by other manufacturers including Chicago's Lyon & Healy with which Ditson shared deep roots and an ongoing business relationship. It is often times ambiguous as to where a given instrument was sourced with makers labels sometimes reading "made expressly for" Ditson. That said, it is assumed that a fair percentage of the instruments cataloged in 1910 were still manufactured by Oliver Ditson in Boston. 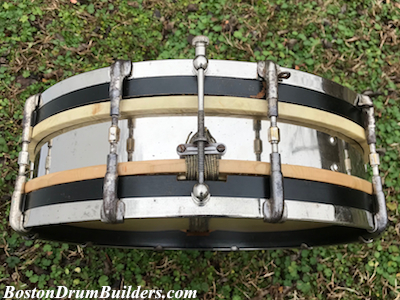 Do you have a drum made by or for Oliver Ditson & Co.? I'd like to hear from you! Feel free to send Lee an email at lee@vinson.net. 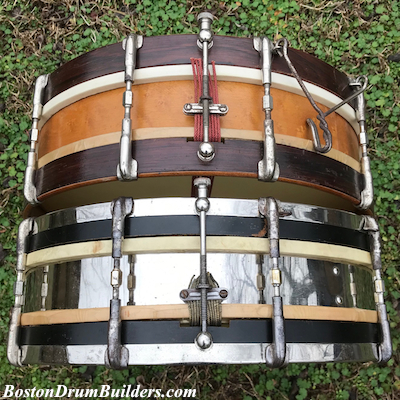 And for more on Ditson and many other Boston based drum makers of the early 20th century, please visit www.BostonDrumBuilders.com.